Somewhere along the line, I decide I've earned something in the order of a treat. I set to work. Somewhere between greasing the cookie sheet and creaming the butter, I poured myself another half glass of wine just as my husband and the puppies bounded through the door. By that time, I was officially distracted. While washing the bowls and talking about our days, I realized I'd completely forgotten to add the sugar. Woops. Heat an oven-proof skillet (cast-iron if you have it) over low to medium heat. Scoop some creamy polenta into a bowl, load up a chicken thigh, give the whole thing a nice spoonful of sauce. You never failed to entice my taste bud Ali. Gorgeous photos and tasty ingredients! I wish I have time this weekend to cook it. Thanks for sharing! Cheers! Love the quote by Audrey Hepburn! And I don’t like dark chocolate either. The sugar incident reminds me of the first time I baked a pie as a tween. I was so excited to serve the pie to my family and when my dad took his first bite I could tell by the expression on his face that something was wrong. I had left out the sugar. Oops. We had a good laugh. The Honey Garlic Chicken looks amazing! Chicken is the main protein I cook with so I am always on the lookout for new recipes! This one sounds amazing, I need to try it soon!! This looks so good. I have not been successful with polenta in the past but I would try it again to go with this chicken. I make chicken about three times a week, so a new recipe is always welcome. I think more of us need to date ourselves more often. I have had some great polenta dishes, I haven’t gotten close to mastering cooking it myself yet. Yours looks and sounds yummy. The whole family would love the chicken. Wish I wasn’t the only one who likes polenta and especially cheese with it. Honey garlic chicken is one of my favorite chicken dishes! 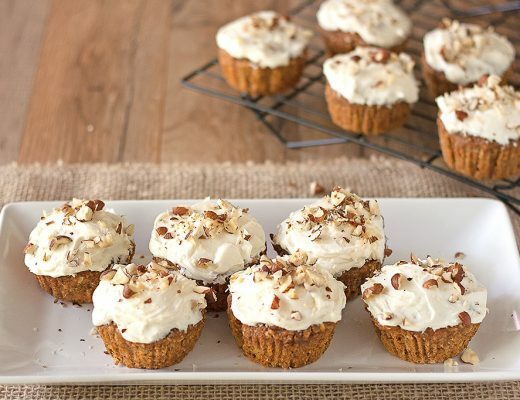 This looks so yummy so I’ll be bookmarking it to make for my family soon! This looks amazing. I just love garlic, so this is the kind of dish I’d scarf down. Sounds like you had quite a satisfying week. I think this chicken is the perfect ending to a great week. It looks delicious. It’s 2 in the morning here in Sydney and this makes me super hungry! I would love to try this recipe especially if our oven is working and if my husband isn’t allergic to chicken haha. Love your photos! 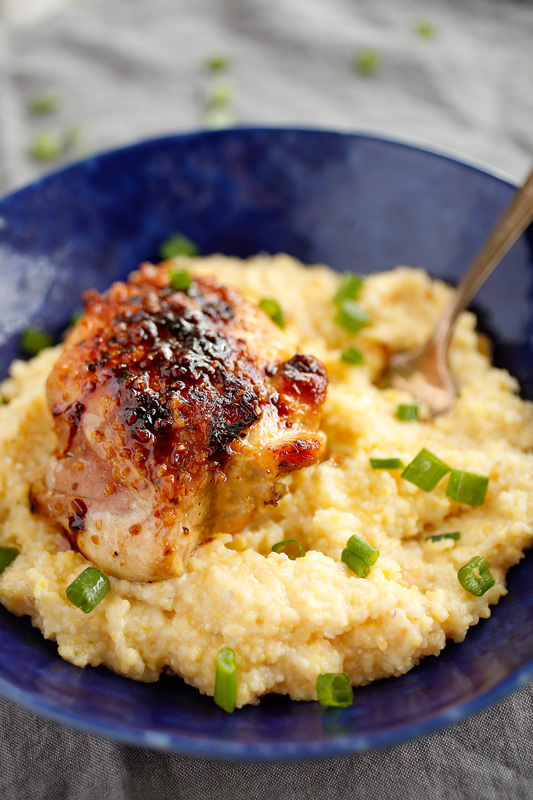 This chicken looks so perfect, and I love a good cheesy polenta! Yum!! Ow wow this looks delicious! I think my family would definitely like some honey garlic chicken. And the cheesy polenta looks tasty too! Thank you so much for this recipe. I was looking for something to make for a casual Friday dinner party and this is IT! I have made so many of your recipes and positive this one won’t disappoint. Many thank-yous from San Diego! Sorry about the cookies – I’ve done that before. But it sounds like the chicken dish was just the comfort food you needed and it looks and sounds utterly delicious. It sounds like you have had a nice week, I have to admit knowing my luck if I fell asleep library I would probably end up snoring really loudly. I have a subscription to Bon Appetit magazine and I really enjoy every single issue! This recipe looks really yummy, except cornmeal. I try to decrease corn in my diet, ’cause I have an allergy to it ( But I think I can use cuscus instead of corn. I love that life is laid back at the moment and there aren’t any storms to hurdle. It really is good. We all make those baking mistakes sometimes and it’s not something that we should be sad about, just another day in the kitchen! 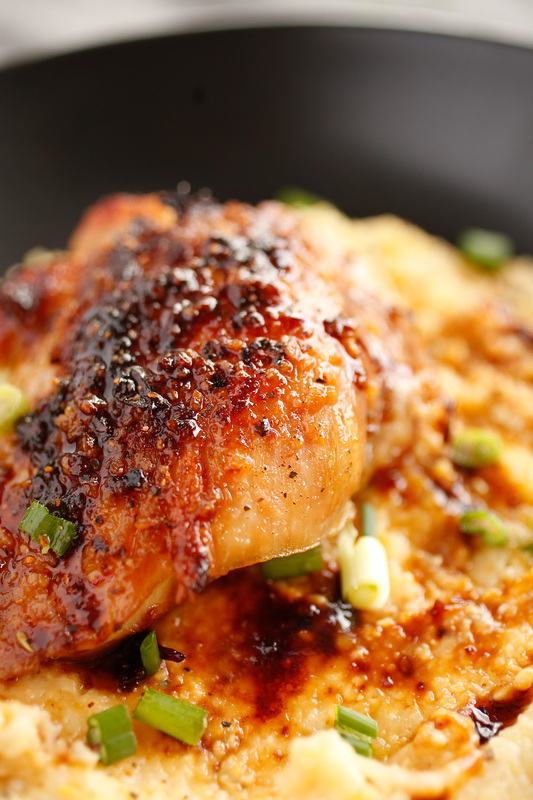 I think this honey garlic chicken with the cheesy polenta definitely made you feel SO much better. It would have made my day! The chicken looks amazing, its gold and so well cooked, it resembles chef quality of fine dining. Believe it or not but I have never had the opportunity of trying polenta before but it sounds delicious. Yummy! Just in time for weekends. I have not try cornmeal before, maybe I can use rice instead? Will it be ok if I use chicken breasts instead of thighs? Oh wow, this really does look fantastic! Chicken thighs are so overlooked and are the best for all those hearty winter dishes. They soak up flavor brilliantly without drying out! I had kind of forgotten about polenta, it’s delish so must get involved soon, ha! I never knew honey and garlic would go so great with chicken together! The chicken looks savory in the pictures!! 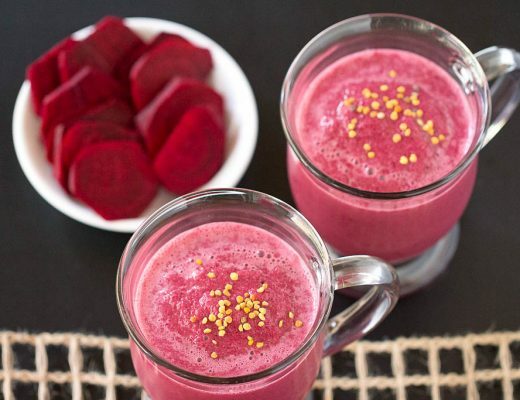 Thank you for sharing such a cozy recipe for this winter! Hope your days stay as warm as your recipe! All the love! Chicken is the main type of food I serve. From chicken legs for the kids to chicken thighs and breasts for adults, it’s something on my food menu each week. This would be a nice meal for me to sneak in on a weekend. I can always use new ways to spice up chicken lol! 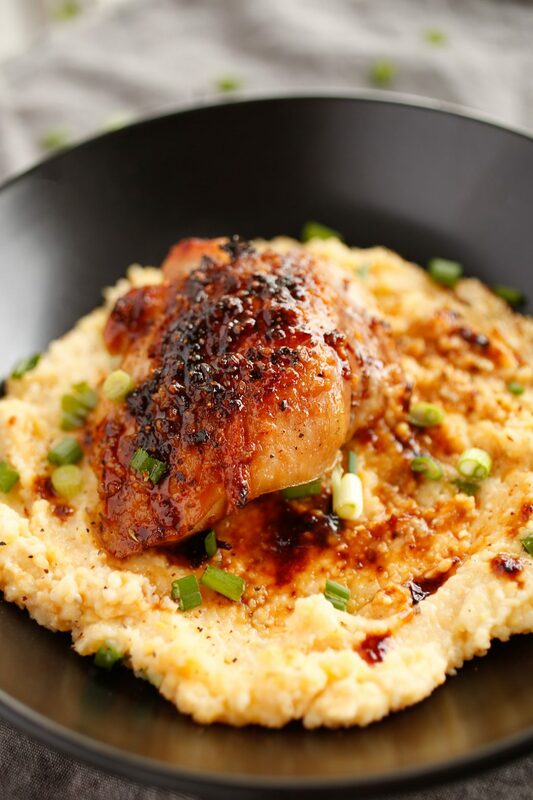 The honey garlic chicken sounds absolutely divine, I’ve not tried polenta before but the sound of adding it with cheese sounds great. A real winter meal and one I shall be adding to the meal plan. I have never tried making polenta, I only see it on food network being done so I am afraid to try. The chicken looks delicious! It sounds like your week went a little better than mine. I can only imagine how that batch tasted without the sugar. I’ve forgotten the eggs when making cornbread before, it tasted terrible. I almost did it the second time around too, thankfully, I caught it before I baked it so it was saved. Your cooking mishap sounds a lot like one I had just the other day. I think my mind was somewhere else completely forgetting I needed to remember ingredients. This might sound funny but the only time i have had polenta is at special events and galas! I love it but I have never thought to make my own. I think I need to check out this recipe. I just defrosted some chicken thighs. I’m ready to try this out tomorrow coz’ my girls need something new. I think they’ll love the honey in it. Thanks for sharing. I’ve never tried polenta though, will have to buy the ingredients for it. This is true comfort food. My family loves Orange chicken and Honey Garlic chicken. I will try your recipe version and I am positive my family will give it a thumbs up! The cheesy polenta is the perfect side! 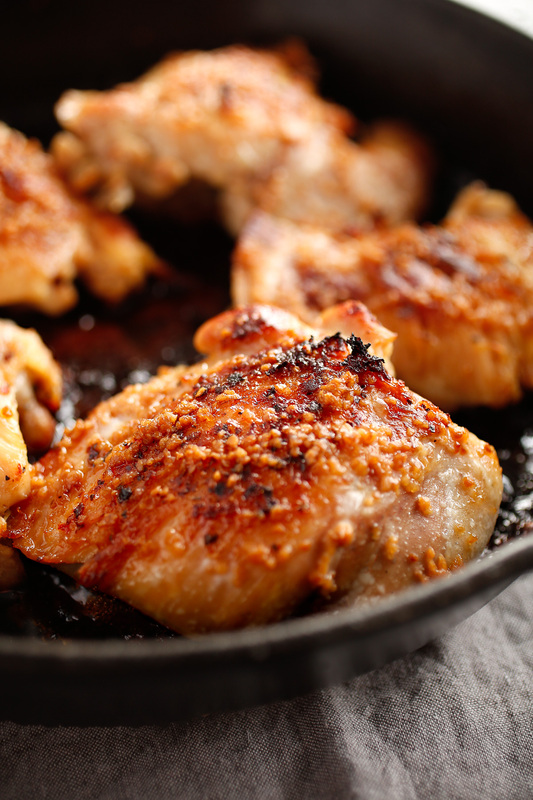 Honey and garlic go so well with chicken! I’m excited to give it a try with the kids tonight. They always love to hang around while I am cooking in the kitchen. It’s fun to have them there to sample things as I cook or just to chat with or just have them doing their homework at the island. The kitchen is the place to be between the hours of 4:00 and 6:00 at our house. It sounds like you’ve had a good week. We definitely all need to take time for ourselves and your hairdresser is right, we are always dating ourselves. I love polenta but have only ever had it deep fried as “chips” so will definitely try your recipe soon. I made this tonight and it turned out beautifully! My whole family loved it and afterward, I heard exclamations of delight that no one felt overly full or weighed-down. I stuck pretty close to the recipe, and as always, it was a hit! It sounds like you’ve had a lovely week! This looks absolutely delicious, `I love honey and garlic, it’s the perfect combination! Oh and I am totally a light weight too! Oh my goodness, this sounds like a heavenly meal! 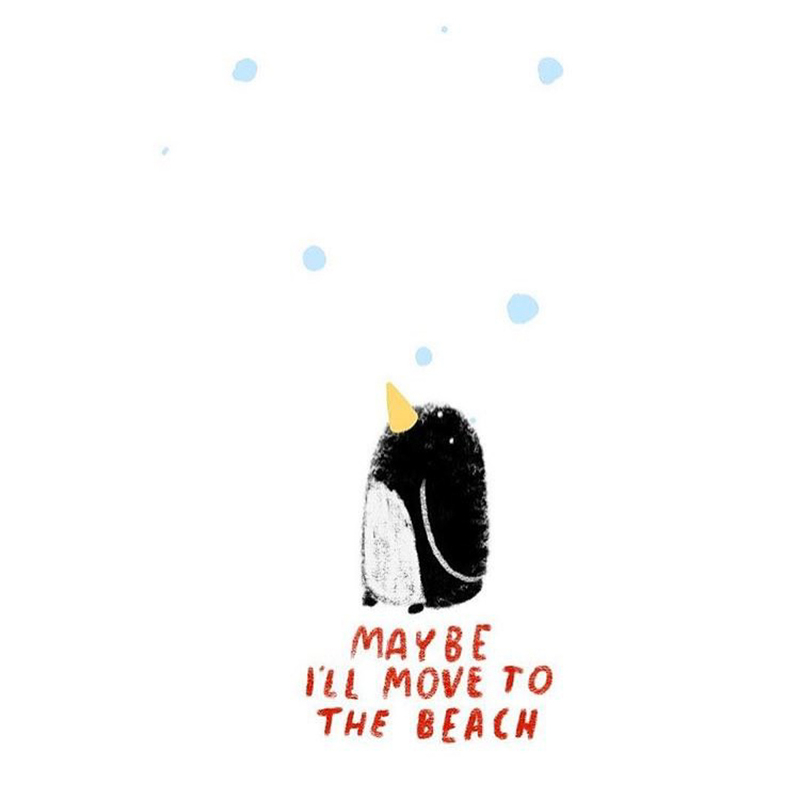 Absolutely ideal for cold weather – which we have here in Maine right now, down into single digits again. I tend to only get boneless, skinless, chicken BREASTS because my hubby prefers the white meat, but I might just try this one with the thighs instead. I love the flavor of honey and garlic together, so this sounds like a winning combination. Love your writing style, too! 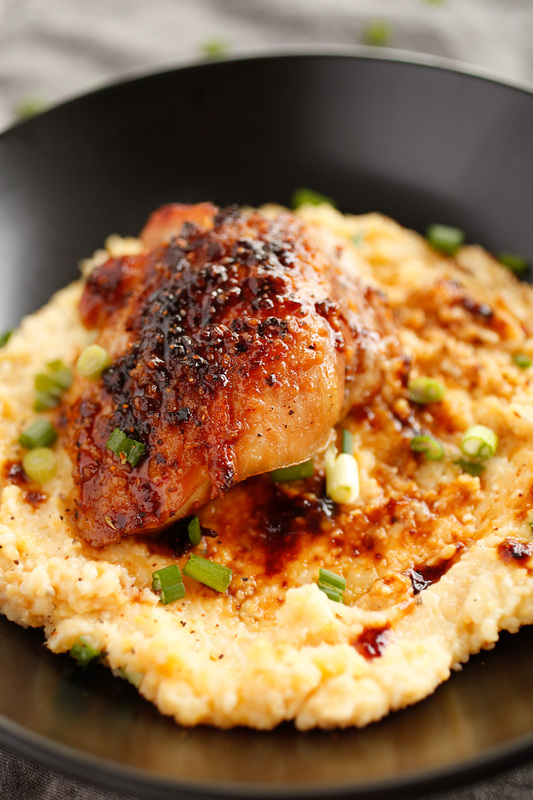 I love chicken and this garlic chicken with cheesy polenta looks divine! Just by looking at your pictures, it makes me hungry! The combination of honey and garlic sounds yum and this recipe looks perfect for the winter night! I love your photos, made me want to go try the recipe straight away. I had a similar cookie fail recently, I accidentally put in two tablespoons of bicarb in instead of two teaspoons. I’ve never had polenta before, it looks intriguing, I’d love to give it a go. Omg though, that chicken looks divine! Oh polenta is just so comforting and I am always looking for new ways to eat it apart from making fries. I am going to have to try this for our next comfort food meal. To be honest, I haven’t tried this dish yet, It looks interesting and yummy – especially I prefer chicken over all other meat. Thanks for sharing, I will try this one of these days. First off, wine with cooking is a must! Second, polenta is one of my most favorite dishes! Do you find that you can cook it in a rush? It always clumps for me. This is one of the best recipes I have seen lately, everything I love, chicken, cheese and then the combination of honey garlic chicken, heaven! Very well written, loved your time management while cooking, from the pictures I can make out how delicious this dish would have turned out. Happy girls are the prettiest. I absolutely love that! 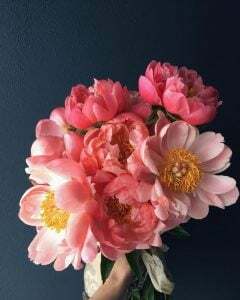 And I totally agree with your hairdresser, you are always dating yourself so why not surprise yourself with flowers more often? Go for it girl! Delicious recipe too! Anything with garlic and I’m sold! Sounds like you had a pretty good week. Blankets, wine and recipe books. What’s not to love! Another amazing dish! I’ve always wanted to try polenta at home and I think this would restore my confidence in cooking savoury food too. Forget about those boo cookies, perhaps they’re meant to be sugar-free? 🙂 Have a wonderful week! I love the way you write it really brings out the life behind the recipe, also I love polenta, it is one of my favourite things but I rarely make it. I am going to have to try this one, it sound like the most stunning family meal. Oh, How did it taste without sugar, well its better to go without sugar sometimes, to cut off those calories;). The quote by Audrey Hepburn was so apt and beautifully narrated. Honey Garlic chicken, I’m sure is a great winter food and I’m gonna replicate your recipe without chicken, but with paneer /potato in it and try out on weekends, as winters are getting harsher. I think I would add sesame seeds to it also. Looks simply AMAZING Ali! I love a honey garlic chicken and this one looks intense. I’ve had nights like that where you are so excited to try a new recipe only to have it not turn out the way you had envisioned and have it take way more time to throw together than you originally estimated. Luckily we have a grocery store in walking distance from our house that one of us can run over to if dinner turns into a mishap or I need a last minute ingredient. Oh hello. HELLO. As I type it’s 9:30 am EST, and I don’t even care that it’s still morning, I would very much like to eat this honey garlic chicken for breakfast. And then again for lunch. And then for dinner. With seconds. Delicious. I just may have to make this happen, as always, you’re so inspiring! Forgetting to add the sugar is hillarious! But your evening sounds amazing. I really should date myself sometime! This recipe sounds delicious, I like polenta and I think my kids would eat this too. Fabulous recipe and you do a swell job with your pictures. I love close-ups of food pictures without any frills. Bookmarking this! Your pictures are always wonderful. They look like they are from some top hotel.? I would love to try honey garlic chicken and I think my husband would love it. I cook polenta often, but not in the oven. I’ve also never tried it with cheese and it looks delicious. Definitely going to try it. I always good new ideas for dishes when I read your blog…i’m also always left feeling hungry! I’m glad you had a good week. Don’t worry about the cookies, this dish sure made up for that! Yummy! Wow! This sounds and looks delicious. 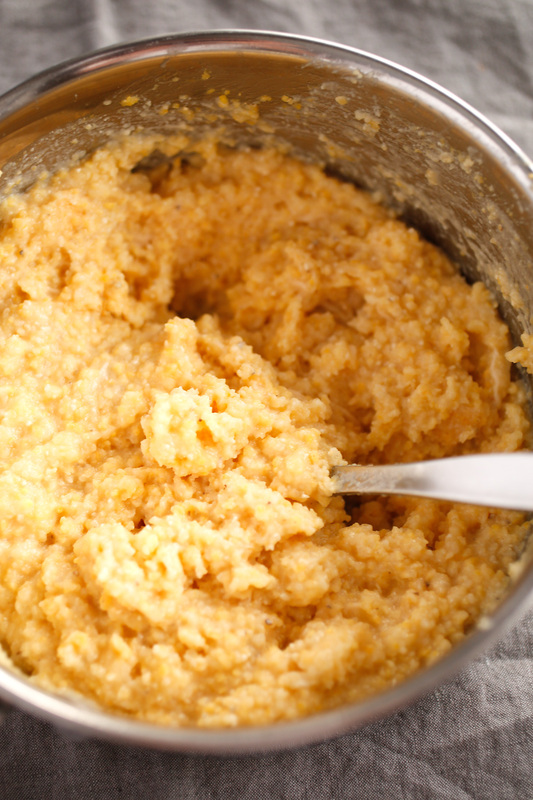 I don’t think I’ve ever tried polenta before… Adding this recipe to my list for dinners! That chicken looks incredibly delicious! I’ve never had polenta, and didn’t think it was so easy to make. I am definitely going to give this recipe a try. Thank you for sharing. I love that other the years you have learned what makes you happy and regaled us with a charming tale of your hairdresser being the same person who married you. She must be a dear friend I am guessing? Also when it comes to polenta I like the taste of it but I am not the worlds best cook, so I need someone who can adapt your cheesy polenta recipe and make it for me! I should never look at your recipes before dinner. Absolutely mouth watering. I wish I was more adventurous in the kitchen. I’m getting there though. Slowly but surely. I think forgetting the sugar in the cookies is fine, it could’ve been a lot worse! Lol. Wine always fixes everything! 😉 This recipe looks delicious! Your photos make me want to try this for tonight’s dinner. amazing! this Chicken is amazing. I love chicken and garlic together and addition of cheese makes it winter comfort. That looks absolutely delicious. Your photography really makes it seem mouthwatering. I may have to have some polenta for dinner! Back to my home country Romania, we have polenta with most of our traditional meals and I miss it a lot. Here in the UK, I am happy to find it in the Polish shops and even if I go home I will bring some with me. The recipe sounds so tasty, I have bookmarked and hopefully, I can give it a try. Sauna after spin class sounds divine. I have not done either. I will have to try those! Even with the sugarless cookies or one too many glasses of wine, you’re still a catch. Most people who are dating themselves would have just ordered pizza! Mmmmm…why does polenta make everything better in the cold months? The coating on your chicken is perfection. I will be making this one for sure! Long time lurker, but had to come out of the woodwork for this one. It caught my eye on Instagram too when Bon Appetit posted the photo. It sounds absolutely fantastic and I might just have to make it tonight. One of my close friends loves honey garlic chicken and she is coming over this weekend. I know she never had polenta and I think I will make it for her. Now, what wine would be the best option, I wonder? ?